Roman Catholicism/Culture. Not forgeting a love for Turkish coffee and Cheese Burek. (mainly due to hours spent playing on construction sites in the pre-war Croatia). 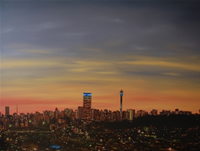 This training enrooted her with a strong discipline of accuracy and detailing, which can be seen in some of her latest body of work entitled: Jozi-the Journey. Growing up in Berea in the early 90's also left an impact, which she has decided to explore in this her latest body of works. Memories of walking to Ponty to pay bills or picking up post at the base of the Hillbrow tower are fresh in her mind. So too commuting via buses in the city centre throughout her schooling years. ever since. Using the camera as a tool in capturing every day scenes around Johannesburg and reproducing this on Canvas is a journey in itself. Fond childhood memories of times gone by reflected at a quick glance of the city as we buzz busily by in our cars on the M and N 1's. The recent regeneration of the inner city brings joy and hope to many South Africans that grew up in and amongst the towering beauties which form the skyline of Joburg. "My work is very labour intensive and in this way therapeutic at times, there is a lot of construction work that happens before the brush even touches the canvas". 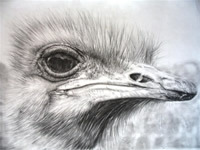 Tanja is currently exhibiting at Artists under the Sun (Zoo Lake-Jhb- 1st weekend of each month).